“Wow!” is a common word heard around Vanderbilt Dyer Observatory. People say it when they look through the Seyfert Telescope and observe spectacular views like the rings of Saturn or craters on the Moon. Crowning one of Nashville’s tallest peaks, Vanderbilt Dyer Observatory is a Tennessee treasure. Surrounded by scenic Radnor Lake State Park and listed on the National Register of Historic Places, Dyer’s telescopes have pointed toward the sky since 1953. Vanderbilt University has a long and respected tradition of astronomy. Vanderbilt University’s first Chancellor, Landon Garland, was a professor of Physics and Astronomy, and many of the university’s original 1875 astronomical instruments and artifacts are housed at Dyer. Also proudly displayed among the historical items is the engraved pocket watch of the famous astronomer and first director of the Vanderbilt University Observatory, Edward Emerson Barnard. He was presented the watch for the discovery of the fifth moon of Jupiter 282 years after Galileo Galilei discovered the first four. In order to inspire student and public interest in science, technology, engineering, math, and astronomy, the observatory offers many activities such as summer camps, teacher workshops, Telescope Nights, tours, special lectures with world-class scientists. Dyer team members bring physics experiments and solar telescopes to classrooms and community events around the mid-state area. Dyer partners with the Vanderbilt Physics and Astronomy department and withorganizations such as NASA and STScI to connect Dyer’s outreach efforts with the space research programs they sponsor. 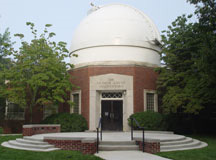 Dyer Observatory connects with the community through the arts as well. Throughout the year, Dyer hosts outdoor performances by local singer/songwriters and musicians during Bluebird on the Mountain concerts, Opera on the Mountain concerts, and Music on the Mountain concerts featuring performers from Blair School of Music. After a glorious sunset and great music, the observatory dome is opened and visitors are invited to view celestial wonders through the Seyfert and DeWitt Telescopes. On the secluded southern point of the observatory grounds is the Star Chamber, an amazing spiral art sculpture of stone and logs created by renowned British land artist Chris Drury. Created in 2006, the domed structure is fabricated from 150 tons of native limestone that was removed from the construction site of the Martha Rivers Ingram Commons, Vanderbilt’s residential complex for first-year students. Keep up with Vanderbilt Dyer Observatory on Facebook, and follow on Twitter @dyerobservers.